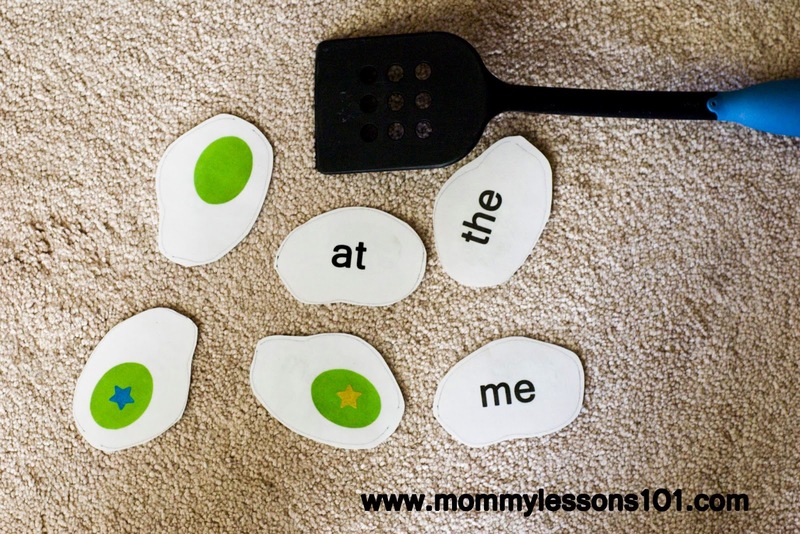 I saw this cute idea for reviewing sight words by playing a pancake flipping game, and I decided to make my own Green Eggs and Ham version of this game to celebrate Dr. Seuss's birthday. 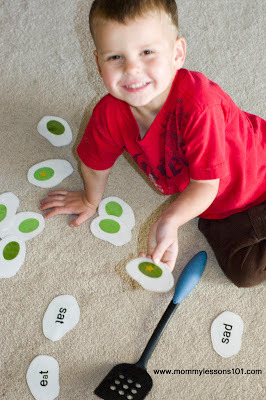 On the back of the eggs, write the words you want your child to practice reading. For my kids, I printed some sight words and CVC words that they could practice. I also included some eggs with names of people in our family. You could also write letters, numbers, math facts, or anything else you want to review with your children. 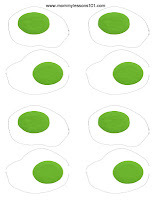 After writing your words, cut out the eggs and laminate if desired. On the back of some, draw a star or put on star-shaped stickers. You can make as many or as few cards as you like. If you don't laminate the cards, you may want to print them on card stock so they are more firm. If you choose to laminate the cards you could also use a dry erase marker to write the words you are practicing so you can change the cards up later. Start with all of the words face up. Take turns choosing a word to read. If you correctly read the word, use a spatula to flip over the egg for the word you read. If there is a star on the green egg, take a bonus turn and read another word. When you are finished, pass the spatula to the next player. Each word that you read correctly you get to keep in your pile of green eggs. See how many green eggs each person can collect! Check out all our Dr. Seuss activities, crafts and lesson plans!